The safer job arranged for a police officer whose specialty is mayhem turns out to be one of the most dangerous. Patrick Gillard and his wife, Ingrid Langley, have taken on many tough cases. As the mother of five children who depend on their father, Ingrid’s happy to see Patrick, a star of the National Crime Agency embedded in the Avon and Somerset Regional Police Crime Unit, most recently assigned to paperwork. But Patrick’s life is never dull, and he’s plunged into another dangerous case when Ingrid, out for a horseback ride, finds David Rolt, commander of a special undercover unit of the Metropolitan Police, badly beaten not far from their home near Bath. Rolt is unwilling to say much but admits that he’s investigating several London mobsters, any of whom could be responsible for his beating. When the bodies of two men are found hanged not far from the scene of the attack, the assumption is that gangster Matt Dorney had them killed for not finishing Rolt off. Both Patrick, who’s successfully passed as a criminal before (Dust to Dust, 2016, etc. ), and Rolt’s former assistant, aristocratic Piers Ashley, resolve to go undercover to ferret out the truth. Patrick’s boss is unenthusiastic, but Patrick and Ingrid go to London anyway to see what they can find. To their surprise, the action shifts closer to home, where Dorney may have set himself up as a pub owner in an attempt to expand his criminal activities. Lack of cooperation between different police departments and an all-out war among mobsters spell danger for Patrick, whose dream of a safer job is threatened by the actions of both dangerous criminals and his own colleagues. 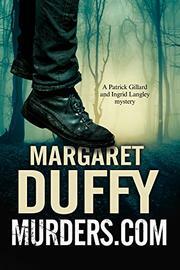 Duffy deftly describes both the procedural details and the more daring undercover work of her protagonists, who close the last chapter with an ominous statement.